Download "10233B: Designing and Deploying Messaging Solutions with Microsoft Exchange Server 2010"
1 Course: 10233B: Designing and Deploying Messaging Solutions with Microsoft Exchange Server 2010 Description: About this Course This five-day, instructor-led course provides you with the knowledge and skills to design and deploy messaging solutions with Microsoft Exchange Server This course describes how to gather requirements for a messaging solution and then design the integration of Exchange Server 2010 with the current infrastructure. The course then covers how to plan and deploy the various server roles in Exchange Server You will explore the various options for implementing messaging security, policies, and compliance. The course also examines the high availability and disaster recovery options and how to develop a troubleshooting plan. Finally, the course describes how to plan the transition from earlier versions of Exchange Server to Exchange Server 2010 and the integration of Exchange Server 2010 with other messaging systems, including with Microsoft Office 365. Audience Profile This course is intended for IT professionals who are responsible for the Exchange Server messaging environment in an enterprise. This IT professional is the senior administrator, or "engineer," who acts as a technical lead over a team of administrators. This person is a third level of support in addition to the Exchange Recipient Administrator, who is the first level, and the Exchange Server Administrator, who is the second level. In an effort to ensure that end users have the best possible messaging experience, this person also evaluates new technologies and tools. The candidate is responsible for planning and deploying the Exchange servers in an enterprise environment. He or she should have a minimum of two years of experience administering, deploying, managing, monitoring, upgrading, migrating, and designing Exchange Server. 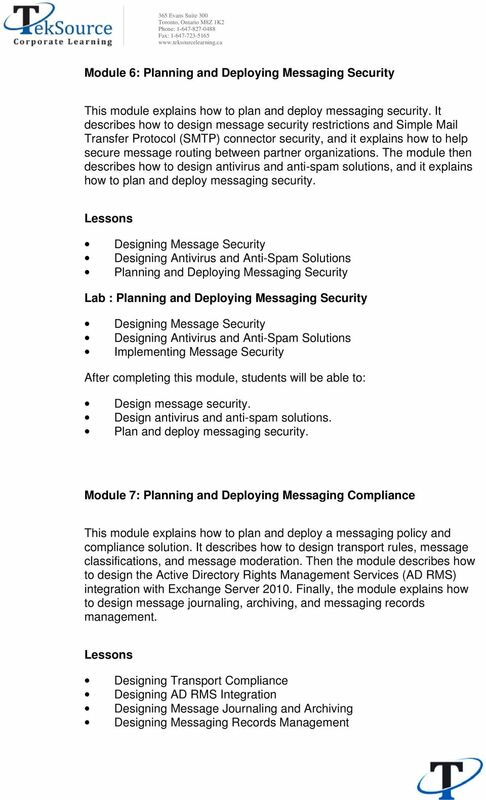 At Course Completion Gather the information required to design a messaging system. Design the integration of Exchange Server with the current infrastructure. 3 Discussion: Real-World Best Practices for Setting Budget Expectations Discussion: Refining the Scope of SLA Requirements Gather business requirements for an organization. Identify additional requirements. Describe service level management. Analyze the current messaging environment. Describe Office 365. 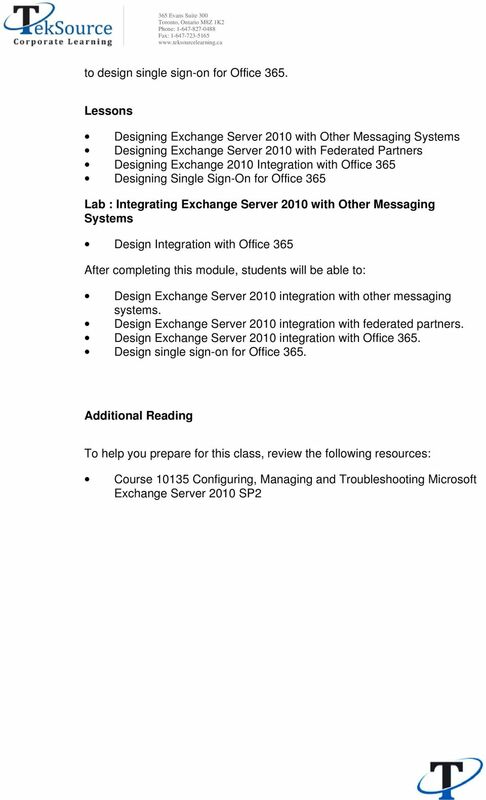 Module 2: Designing Microsoft Exchange Server 2010 Integration with the Current Infrastructure This module explains how to design the integration of Exchange Server with the current infrastructure. It describes how to design the network infrastructure, the Active Directory directory service infrastructure, and the Domain Name Service (DNS) infrastructure. 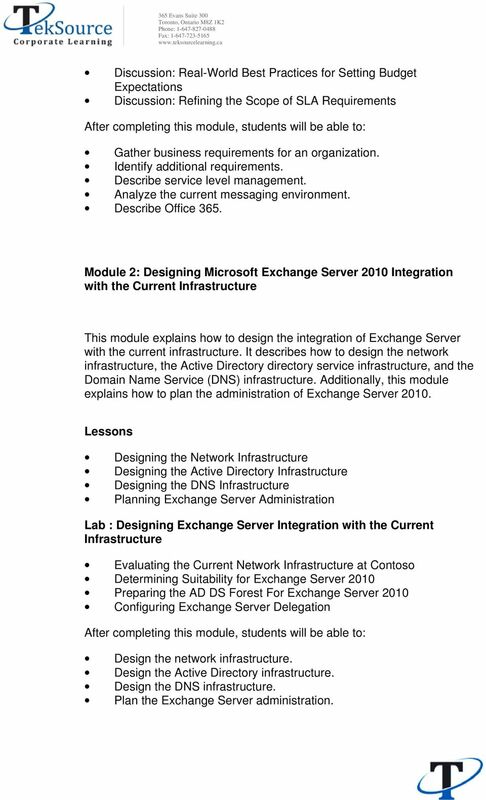 Additionally, this module explains how to plan the administration of Exchange Server Designing the Network Infrastructure Designing the Active Directory Infrastructure Designing the DNS Infrastructure Planning Exchange Server Administration Lab : Designing Exchange Server Integration with the Current Infrastructure Evaluating the Current Network Infrastructure at Contoso Determining Suitability for Exchange Server 2010 Preparing the AD DS Forest For Exchange Server 2010 Configuring Exchange Server Delegation Design the network infrastructure. Design the Active Directory infrastructure. Design the DNS infrastructure. Plan the Exchange Server administration. 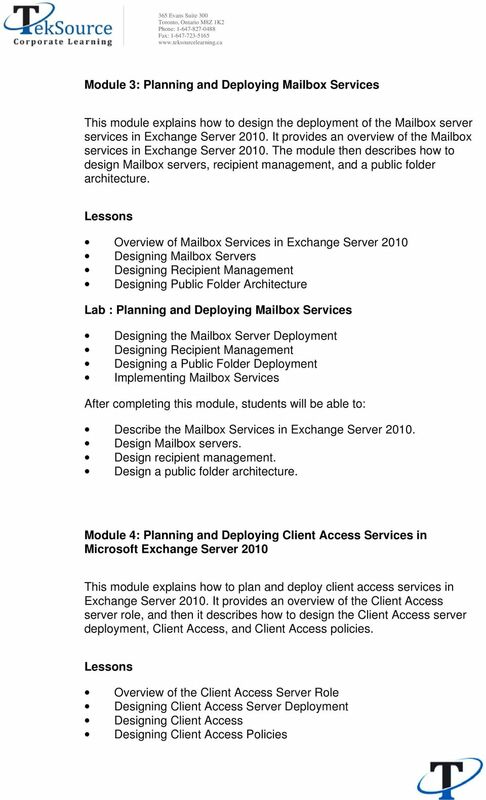 5 Lab : Planning and Deploying Client Access Services in Exchange Server 2010 Designing the Client Access Server Deployment Designing Client Access Implementing Client Access Describe the functionality of the Client Access server role. Design the Client Access server deployment. Design Client Access. Design Client Access policies. 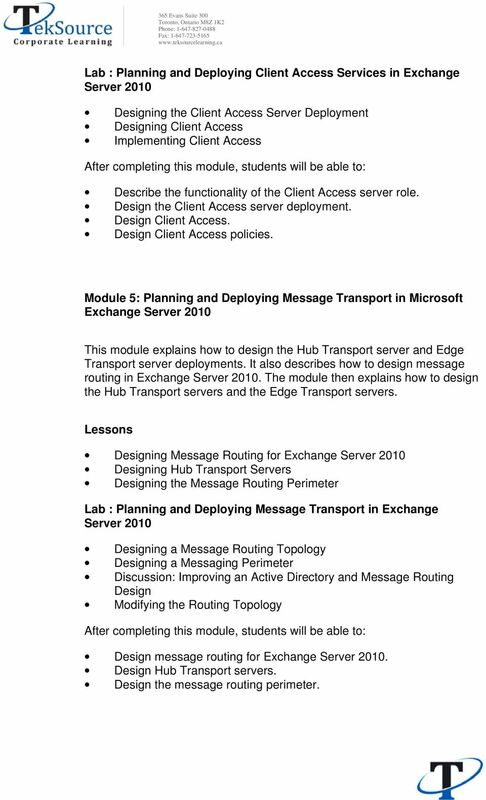 Module 5: Planning and Deploying Message Transport in Microsoft Exchange Server 2010 This module explains how to design the Hub Transport server and Edge Transport server deployments. It also describes how to design message routing in Exchange Server The module then explains how to design the Hub Transport servers and the Edge Transport servers. Designing Message Routing for Exchange Server 2010 Designing Hub Transport Servers Designing the Message Routing Perimeter Lab : Planning and Deploying Message Transport in Exchange Server 2010 Designing a Message Routing Topology Designing a Messaging Perimeter Discussion: Improving an Active Directory and Message Routing Design Modifying the Routing Topology Design message routing for Exchange Server Design Hub Transport servers. Design the message routing perimeter. This course is intended for IT professionals who are responsible for the Exchange Server messaging environment in an enterprise. 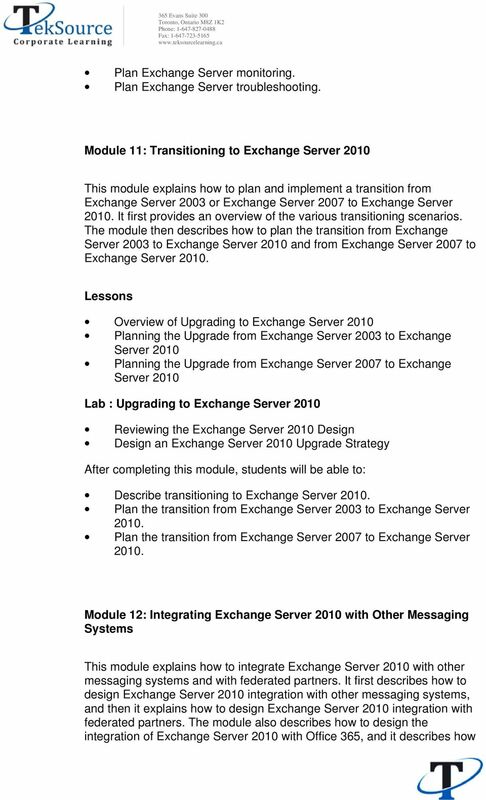 Updating Your Skills from Microsoft Exchange Server 2003 or Exchange Server 2007 to Exchange Server 2010 Course 10165; 5 Days, Instructor-led Course Description There are two main reasons for the course. Course 20341B: Core Solutions of Microsoft Five Days, Instructor Led About this course This course will provide you with the knowledge and skills to plan, deploy, manage, secure, and support Microsoft. 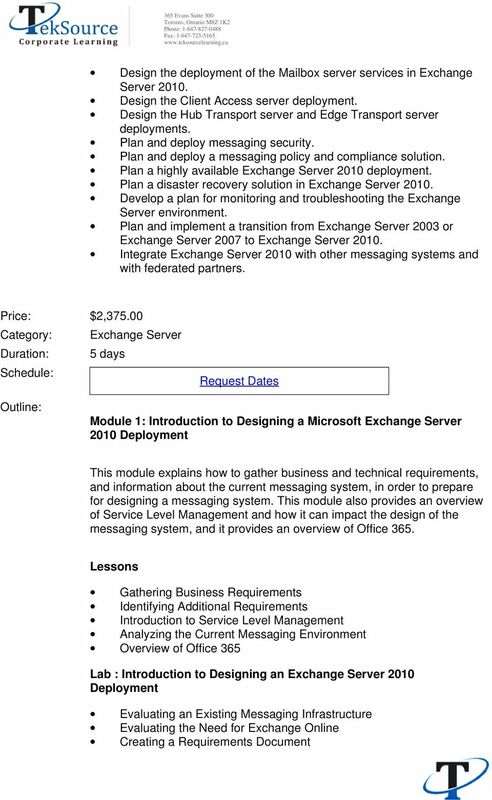 Administering Microsoft Exchange Server 2016 20345-1; 5 Days, Instructor-led Course Description This 5-day instructor-led course teaches IT professionals how to administer and support Exchange Server 2016. 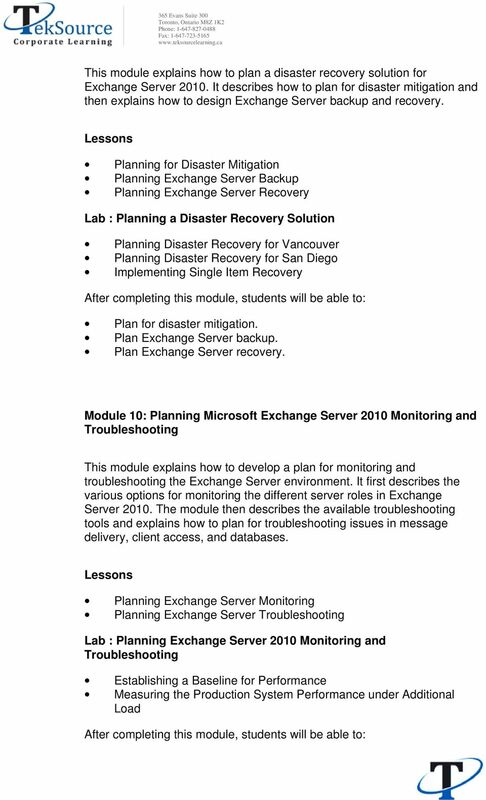 Deploying MS Exchange Server 2010 Course Outline- Duration-5 Days Module 1: Deploying Microsoft Exchange Server 2010 This module describes how to prepare for, and perform, an Exchange Server 2010 installation. At Course Completion After completing this course, students will be able to: Take This Training. On This Page Introduction. 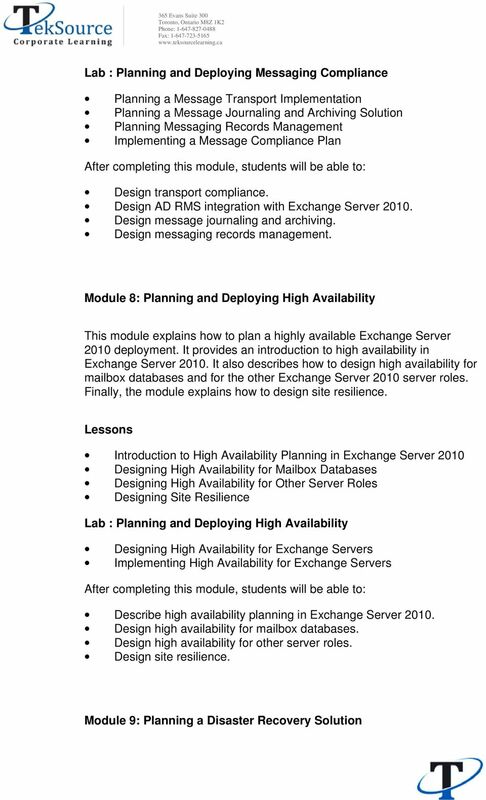 Designing a High Availability Messaging Solution using Microsoft Exchange Server 2007 Course 5054A: Two days; Instructor-Led Preliminary Course Syllabus Note: You are viewing a Preliminary Course Syllabus. 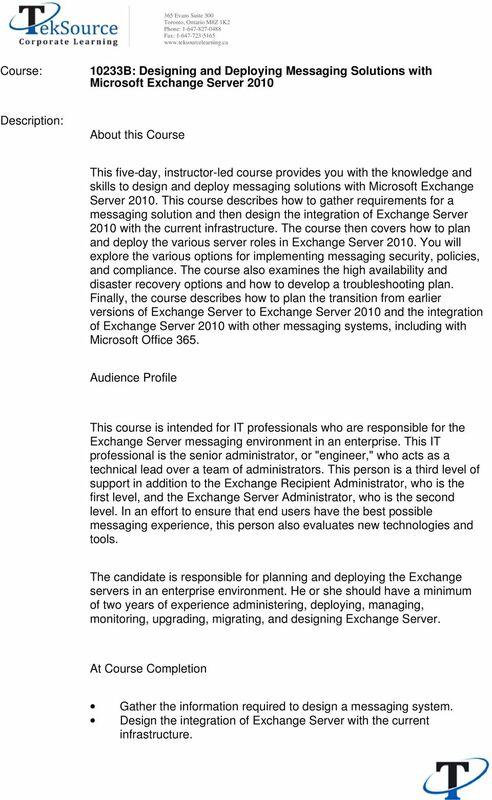 Microsoft Exchange, Upgrade from Exchange 2000/2003 COURSE OVERVIEW This instructor-led course offers Microsoft Exchange Server administrators with the skills they need to manage a Microsoft Exchange infrastructure. Course Outline. Core Solutions of Microsoft Lync Server 2013 Course 20336B: 5 days Instructor Led. About this Course.